With Father's Day just a few weeks away, you may already be planning a great gift to celebrate the special dad in your life. Of course, giving a necktie seems to be the classic gift for Father's Day. But this year, you can give dad the gift of tying the perfect Double Windsor with every one of his neckties. The Perfect Knot is a company who has invented a very nifty tie clip which makes tying a Double Windsor quick and easy. Keep reading to learn more about a wonderful Father's Day gift idea! I reviewed The Perfect Knot Valet Box from The Perfect Knot, which retails for $29.50. Since my husband is always losing the collar stays of his dress shirt, I really appreciated three sets of these being included along with The Perfect Knot tie clips. Because this valet box is now a permanent fixture on his dresser table, I'm sure he will be able to store his additional collar stays here as well, keeping everything organized and together. The steps to using The Perfect Knot are very straightforward, though I definitely recommend watching the DVD several times first. It does take a little practice, but with just a few tries, my husband seemed to pick up the technique and was tying a great looking necktie! I love how the steps were also imprinted into the inside of The Perfect Tie Valet Box for a quick and easy reference, when needed. Watch the video below to see exactly how to use The Perfect Knot, from the creator himself. It really is just that simple! The great thing about this system is that The Perfect Knot clip stays completely concealed in your tie, it actually helps center the dimple and keeps your tie in place. My husband was elated with The Perfect Knot because he has worn a tie to work every day for over 10 years and never could figure out how to tie a Double Windsor, even though he admits that this knot is his favorite. He even told me that he's had friends and co-workers show him how to do it, but could never master this knot on his own. Now, thanks to The Perfect Knot, he's a Double Windsor pro! 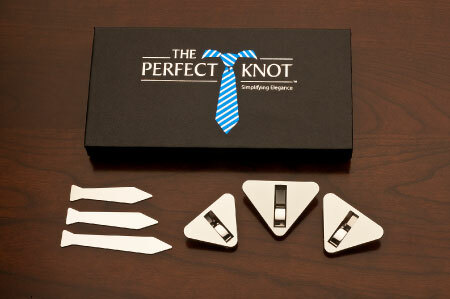 Instead of giving dad another tie this year, show him how to tie one perfectly with help from The Perfect Knot! Disclosure: I received The Perfect Knot Valet Box from The Perfect Knot in order to facilitate my review. No other compensation was received. This product review is based on my own personal experiences with this item and is completely honest and objective.